“That’s an awfully ballsy question coming from a stranger. But, since you asked…first and foremost, I only spend money on what brings us real value and happiness. That eliminates a lot of spending on things I believe most American families would classify as ‘necessities.’ Such as: Cadillac phone plans, low deductibles on auto insurance, cable, memberships, mid-day dining, airfare, vehicular commutes, non-performing emergency funds. You know, middle-class stuff. Another, less-visible piece of that expense cutting is taxes. In all my working years, even when I was cash-flow negative in NYC, I always maxed my IRA and 401k. These deferments (along with a big house, never-ending education deductions, and a growing family) result in a federal effective tax rate of 2-3%. Otherwise, actual expenses—not including payments to reduce the principle on debt—are around $3,500-4,000 per month, which means I save about 60% of my disposable income. The money goes a few places. The 401k is 100% in an S&P 500 mutual fund. My IRAs are primarily in widow and orphan dividend growth stocks, and I keep about one year’s worth of expenses in high-yield preferred ETFs as an emergency fund. I also dabble in some fun, speculative stocks that I think can be huge winners over time. Here’s my whole portfolio, which is updated in real time. One nice aspect of waiting six months between financial updates is that there’s actually items of substance to talk about. I save around $350 per month in interest, allowing me to recoup the closing costs in about 11 months. My monthly payment decreases by $450, leaving more money to apply to principle. We plan to move in less than five years, anyway (at retirement). My primary goal regarding the home is to build enough equity (~$250k) in the current home so we can sell it and buy a similar house outright in a cheaper locale. Thus, any reset on the loan rate should be a moot point. I’ve seen some bumps in pay and a couple bonuses, expanding the gap between income and expenses. My salary is the highest it’s ever been, which is nice. I’ve moved into a larger leadership role, and am back to managing folks. These all bode well for future earnings. I’m also nearly complete with all my requisite CPA courses. A CPA designation is something I want to have for my retirement, as it will allow me to more easily find freelance and temporary work, should the need or desire arise. As I said above, my savings rate is about 60% right now. Gross income, above, includes things like dividends, employer 401k matching, and small bonuses and side income. So, my salary isn’t exactly $130,000; it’s reasonably less than that. The exact methodology for calculating a savings rate is an idle pursuit. So, if you calculate it a bit differently, no problem. Bottom line, if you’re doing the best you can, then the exact interpretation of the percentage matters not. I won’t deny that a solid income does make my $55k annual deferment to retirement a hell of a lot easier. But, on the flip side, for my area, we’re not wealthy. The site IncomeByZipCode tells me that the median household income for my city is $109,000, and the average is $116,000. I expect those numbers don’t include some of my own aforementioned additions to gross income, so for my area, our household income is perfectly average. Late in 2015 I wrote a post that detailed how I earned $5,300 in cash and travel in my first ten months of credit card churning. In that post, I admitted I wasn’t sure how sustainable the endeavor would be year after year. As 2016 closes, I’m proud ashamed to say that we’re on pace to actually beat that amount, with just north of $5,100 in cash and travel year-to-date. I highly recommend the churning game to all interested (and financially responsible) parties. My last update on April 4th, 2016 had my net worth at $386,762. The S&P500 is up 6.7% since then. 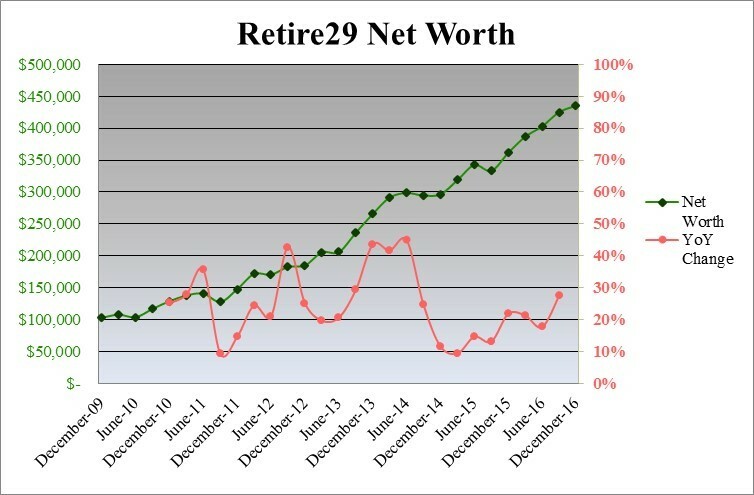 My net worth, however, is up 12.55% since then, and now sits at $435,323. Wow, a $49k rise in 7.5 months, and about an $88k rise from this time last year. If it weren’t for the one-time expense associated with the refinance, then it would have actually been about $4k higher. However, that only means that my net worth should grow faster going forward, as less and less (about $1k less per quarter) of my money is going toward interest. DO NOT USE THIS GRAPH ANYMORE! The line represents the ratio of passive income and side hustle income in a given month against expenses for that month. I wish I never knew that graph. I hated it because it was so misleading. Because I have a mortgage and house that I won’t have during retirement, the line will be permanently depressed because my expenses are not at all reflective of my retirement housing situation (which is a HUGE [>50%] part of my expenses). Equally stupid is that I’m using a passive income metric even though most of that passive income is accrued to retirement accounts, so it’s not like it’s “cash in hand.” During retirement, I’ll still be withdrawing assets. Money is fungible, so it matters little whether I’m pulling out dividends or shares. The total asset base, rather than the income generated from it, is what matters most, and that was totally absent from that chart. Bottom line, that line was not a clear indication of true progress. The goal isn’t changing, and the numbers aren’t really changing, either. The only thing changing is my yardstick. From here-on-out, I’ll be aiming for a simple $1,000,000 net worth target for financial independence. 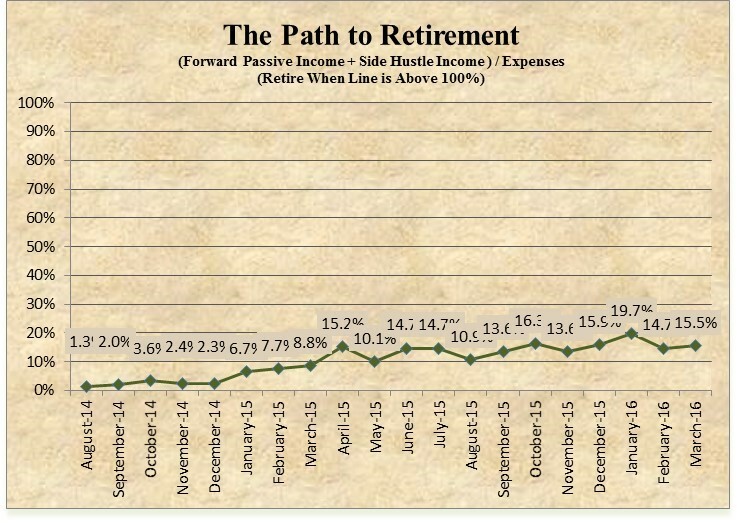 Even though my progress appears farther along than in the “Passive Income” chart, the numbers are actually more conservative. A few months back when I did a deep dive into my retirement expenses, I calculated that I would need $609,666 in investments to support my lifestyle. Now, I’m aiming for $750,000 ($600k in IRAs and $150k in current assets). I’ve spoken at length that early retirees should have one-fifth of your nestegg outside of IRAs, the IRA portion can be tapped penalty free after a five-year Roth conversion waiting period. That one-fifth “free and clear” portion is meant to get me through those first few years. 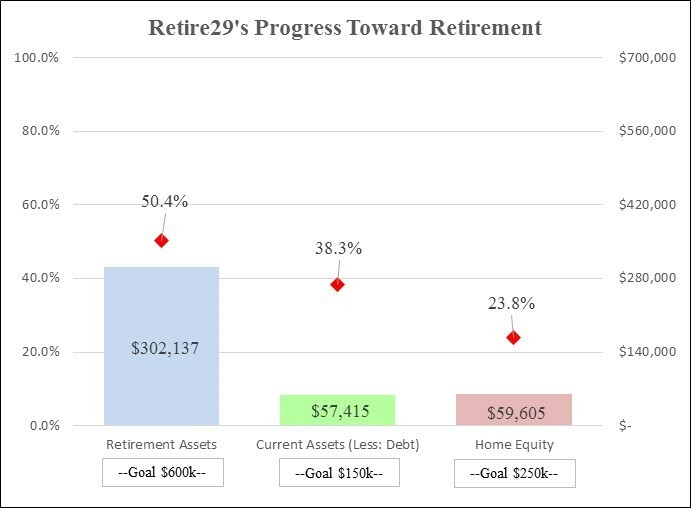 The third column details my progress toward $250k in home equity. This is where I am most behind, as I’m only 23.8% of the way there. We are doing some home improvements right now (just hired a contractor) to add a basement bathroom and bedroom to our home. That cost won’t be recouped entirely in additional equity, but some of it (~60%) will. Beyond that, the forced savings of a mortgage will keep this bar moving higher, but $250k in five years will require some additional investment beyond straight-line mortgage amortization. That’s a problem for tomorrow, though. My favorite aspect of looking at progress through this lens is that I can direct my efforts more intentionally. If I find myself flush in retirement assets in a few years, I might dial that back a bit (in full consideration of taxes) and put more money toward our home or current assets. In my first and second retirement roadmaps, the breakdown wasn’t this clear. Now, it is. I want to write so much more. I want to talk about the market’s reaction to Trump’s victory. I want to discuss some of the innovative money-saving things I’ve been involved in recently. I want to discuss my thoughts on the stock market and my portfolio. I want to talk about my passive income (currently $977 per month). I want to give a life update and how things are going around here. But, it’s been too long since I posted. All of that can wait for another day. Better to post a “90%” article today than a “100%” article never. Just a note that the Delta offer isn’t the best available. There’s a 70k offer with waived annual fee but the spending is higher. Are you talking about the AmEx Delta Platinum card? It’s 70k miles but the $195 fee isn’t waived like it is with the Skymiles Gold that I referred. I could be wrong, though. You got a link? Eric I have been wondering if I was going to hear from you again. It has been to long between posts and I love your writing style. Keep up the good work, it seems you have been busy even though you haven’t been posting. Good to hear from you again bud! You obviously have been making some good decisions as that increase in your net worth is awesome! Congrats on that! Glad to see your motivation and passion for early retirement is still there. Its a long gruesome plan like mine is but it will happen one day.